The National Coracle Centre is a Museum and Workshop of Coracles from around the world set in the grounds of a 17th Century Flour Mill beside the beautiful Cenarth falls famed for its Salmon Leaps and 200 year old Bridge over the Teifi River. The Museum, apart from its fine collection of coracles covers the history of coracles and the techniques and tools for building them. Also a section on the implements and methods used for the equally ancient art of poaching. The Museum houses an international collection of coracles from as far afield as Vietnam, North America, India, Tibet and Iraq to complement the collection of coracles from around our home islands. 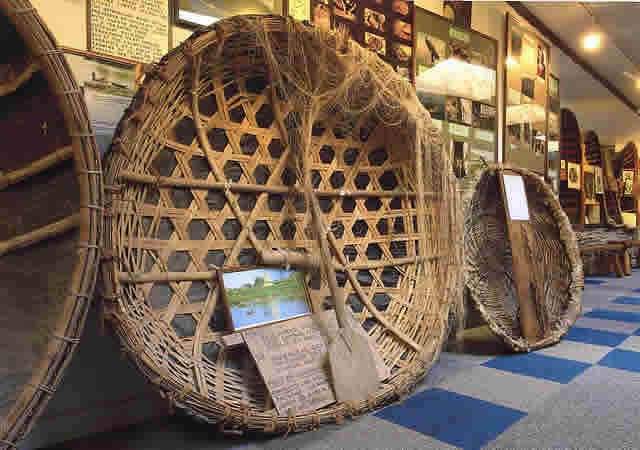 The museum also incorporates a work-shop to show the ancient craft of coracle making. Young children can also sit in a coracle and watch a video of how they are made. Oval in shape and very similar to half a walnut shell, the structure is made of a framework of split and interwoven willow rods, tied with willow bark. The outer layer was originally an animal skin such as horse or bullock hide (corium), with a thin layer of tar to make it fully waterproof – today replaced by tarred calico or canvas, or simply fibreglass. The Vietnamese/Asian version of the coracle is made somewhat differently: using interwoven bamboo and waterproofed by using resin and coconut oil. The structure has a keel-less, flat bottom to evenly spread the weight of the boat and its load across the structure and to reduce the required depth of water – often to only a few inches, making it ideal for use on rivers..
Each coracle is unique in design, as it is tailored to the river conditions where it was built and intended to be used. In general there is one design per river, but this is not always the case. The Teifi coracle, for instance, is flat-bottomed, as it is designed to negotiate shallow rapids, common on the river in the summer, while the Carmarthen coracle is rounder and deeper, because it is used in tidal waters on the Tywi, where there are no rapids. Teifi coracles are made from locally harvested wood – willow for the laths (body of the boat), hazel for the weave (Y bleth in Welsh – the bit round the top) – while Tywi coracles have been made from sawn ash for a long time. The working boats tend to be made from fibreglass these days. Teifi coracles use no nails, relying on the interweaving of the laths for structural coherence, whilst the Carmarthen ones use copper nails and no interweaving. They are an effective fishing vessel because, when powered by a skilled person, they hardly disturb the water or the fish, and they can be easily manoeuvred with one arm, while the other arm tends to the net; two coracles to a net. The coracle is propelled by means of a broad-bladed paddle, which traditionally varies in design between different rivers. It is used in a sculling action, the blade describing a figure-of-eight pattern in the water. The paddle is used towards the front of the coracle, pulling the boat forward, with the paddler facing in the direction of travel. Another important aspect to the Welsh Coracle is that it can be carried on his back by one person. 'Llwyth dyn ei gorwgl' — the load of a man is his coracle. (Welsh saying). Designed for use in the swiftly flowing streams of Wales and parts of the rest of Britain and Ireland, the coracle has been in use for centuries, having been noted by Julius Caesar in his invasion of Britain in the mid first century BC, and used in his campaigns in Spain. Remains interpreted as a possible coracle were found in an Early Bronze Age grave at Barns Farm near Dalgety Bay, and two others have been described, from Corbridge and from near Ferriby. According to Ian Harries, coracle fisherman, coracles are so light and portable that they can easily be carried on the fisherman's shoulders when proceeding to and from his work. Coracle fishing is performed by two coraclers. Where fishing is performed by two people, there is one fisherman per coracle. The net is stretched across the river between the two coracles (the coracler will paddle one handed, dragging the net in the other) and drawn downstream. When a fish is caught, each hauls up an end of the net until the two coracles are brought to touch, and the fish is then secured, using a priest (or knocker – a small block of wood) to stun the fish. 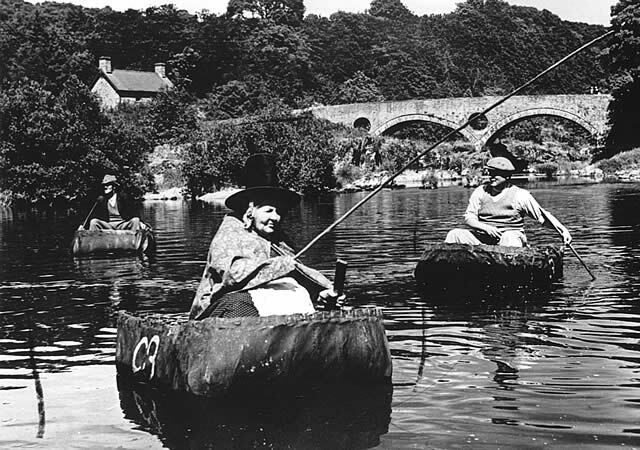 Coracles are now seen regularly only in tourist areas of West Wales, and irregularly in Shropshire on the River Severn – a public house in Sundorne, Shrewsbury called "The Coracle" has a pub sign featuring a man using a coracle on a river. The Welsh Rivers Teifi and Tywi are the best places to find coracles in Wales, although the type of coracle differs depending on the river. On the Teifi they are most frequently seen between Cenarth, and Cilgerran and the village of Llechryd. In 1974 a Welsh coracle piloted by Bernard Thomas (~1923-2014) of Llechryd crossed the English Channel to France in 13½ hours. The journey was undertaken to demonstrate how the Bull Boats of the Mandan Indians of North Dakota could have been copied from coracles introduced by Prince Madog in the 12th century. Guided tours of the coracle exhibition are available and can be booked in advance. A tour lasts about 30 mins. Groups of over 50 people may have to be divided into two groups. A visit to the 17th Century Mill is included in your trip. The nuseum is wheelchair accessible and assistance dogs are welcome. The Ty Te cafe next door offers excellent sustenance. Transport : Cardigan or Carmarthen (National Rail) then bus (460). Bus Routes : 460 stops outside. Opening Times : Sunday to Friday 10:30 to 17.30.